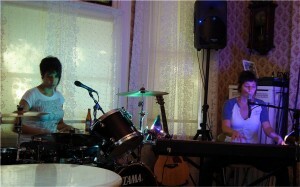 Just an update on the last house concert we had…it was really fun. 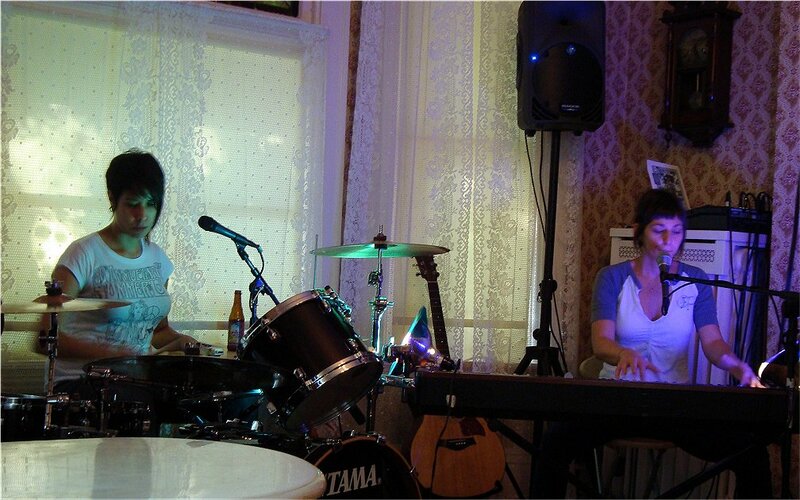 Performing was Steph Taylor and the State Of (‘the State of’ being Nabedi Osorio on drums). They stayed with us for most of the weekend along with their friend Candace and we had a great time. I just wish they could have stayed longer. We had a blast sharing our favorite YouTube videos together, eating Thai food, and making fun of the sound our downstairs toilet makes when it flushes. It can wake the dead with its eerie burp-like sound. The latter will appear in one of their upcoming video blogs. I am in the process of editing the video I took. I have some songs that would potentially be ready to post, but I have to clear it with the ladies first because the content might be confidential. That sounds way worse than it is. What I mean is some of the songs they played might not be ready for mass consumption yet. That sounds wrong too. Well, at any rate…soon I will post some video. Subscribe to the blog (the big orange R on the right side nav bar) so you won’t miss anything. A big fat sloppy thank you goes out to all of you who came to the show and helped make our last house concert a excellently fun time (even if there were only a few of us). YOU are the reason I hate to stop doing these, but everyone else is the reason that I am.